The idea for Stay The Trail Colorado was born in 2003 when a small group of off-highway vehicle (OHV) enthusiasts decided a new approach to land management issues was needed in Colorado. This new approach was to educate the public on responsible OHV use and to develop a sense of stewardship for our public lands among OHV enthusiasts. Since our first brochure was published in 2005, the program has grown into a resource that both the public and the land management agencies can count on to educate the public and protect our natural resources in Colorado. Our mission is to reinforce and highlight responsible OHV use, and to modify and mitigate irresponsible use in an effort to minimize resource damage on public land. 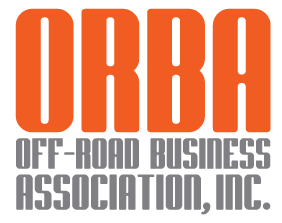 Our goal is to create a statewide culture of responsible OHV use which will continue beyond the life of the project, effectively creating a stewardship ethic among all Colorado OHV recreationists. To accomplish our mission, Stay The Trail offers educational services and materials to land management agencies, OHV and OHV accessory dealers, educational and community institutions, and the general public. Our services include trailhead and event staffing, as well as classroom, conference, and meeting presentations. We also provide educational materials. Our traveling educational trailers are cornerstones of the Stay The Trail program. 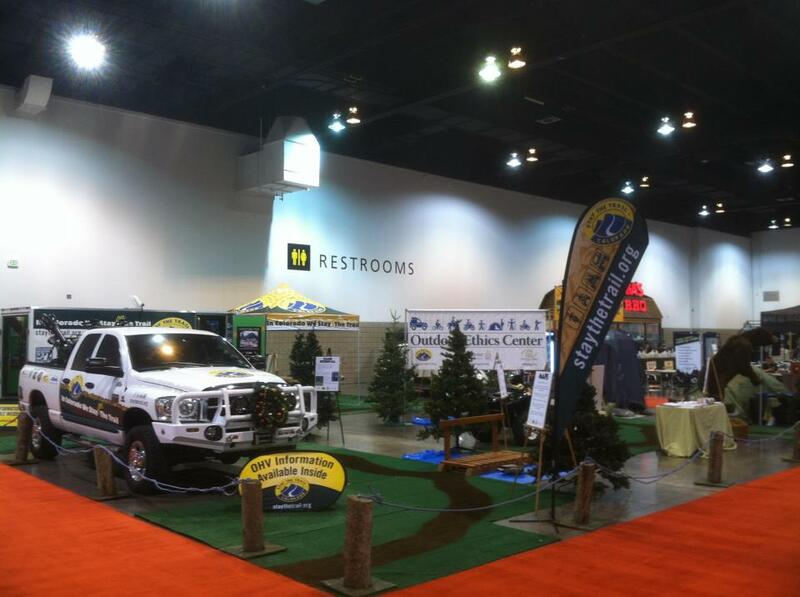 They can be found at numerous trailheads, trade shows, and dealer open houses during summers in Colorado. The trailers are self-contained traveling educational resources full of information, brochures, posters, and videos on responsible use of public lands. 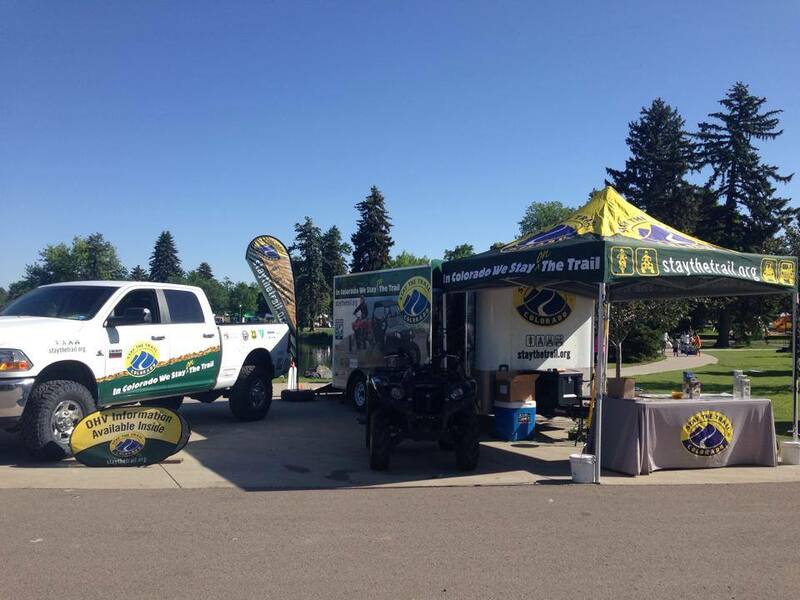 Visit our Stay The Trail Trailer page to request the trailer at your next event! 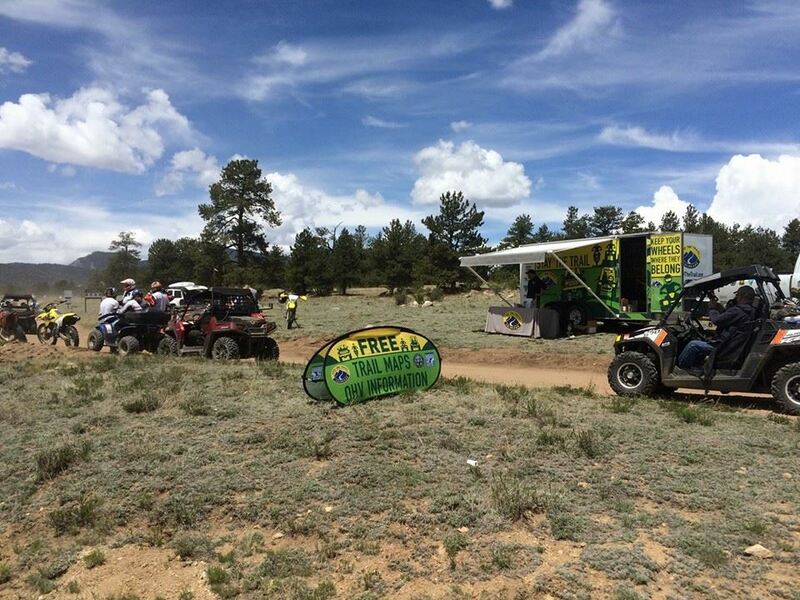 For smaller venues and events, club meetings, trade show booths, or conferences, we can leave the trailer behind and send a staff member to make a presentation or be on-hand at your event or meeting to answer questions about OHV use on public lands. Contact Us for more information about our presentations! Our available materials include brochures, videos, a website, and a Colorado OHV opportunities map with information on over 85 OHV opportunities within the state. We also have various materials such as posters, brochures, an OHV opportunities map, and videos available for distribution by land management agencies, OHV clubs, OHV and OHV accessory dealers, four-wheel drive vehicle dealers, tourist information centers, etc. To learn more about the available materials, visit our Educational Materials page! Stay The Trail is a program of the Stay the Trail Education & Stewardship Alliance. The program’s steering committee includes Colorado Parks and Wildlife, the Bureau of Land Management, the USDA Forest Service, the Colorado Off-Highway Vehicle Coalition (COHVCO), and representatives of other motorized and non-motorized user groups. The Stay the Trail Education & Stewardship Alliance is a 501(c)(3) educational organization. Donations are tax deductable to the extent allowed by law. It is recognized that the depicted activities involve inherent risks and that the safety of the operator and participant depends upon the prudent exercise and discretion of the operator. This information is notintended to provide guidance on how to negotiate obstacles, but rather for protecting the environment. Consider the severity of the obstacle, the capability of the vehicle and your experience level while crossing obstacles. Always use proper protective gear manufactured for your off-highway experience. Safety gear and equipment requirements are dependent upon the type of vehicle. Consult your dealer and vehicle manufacturer for specific needs. The parties publishing this information hereby disclaims any and all liability associated with the provided information or arising from the depicted activities. "Stay the Trail" and the Stay The Trail Colorado mountain and trail oval logo are registered trademarks of the Stay the Trail Education & Stewardship Alliance. "Stay the Trail Colorado", "staythetrail.org", "staythetrail.net", and "staythetrail.com" are trademarks of the Stay the Trail Education & Stewardship Alliance. "In Colorado We Stay The Trail" is a registered trademark of the Stay the Trail Education & Stewardship Alliance. "Colorado Trail Patrol" and "Keep Your Wheels Where They Belong" are trademarks of the Stay the Trail Education & Stewardship Alliance. These trademarks may not be used without the express written permission of the Program Director of the Stay the Trail Educations & Stewardship Alliance Campaign. "Stay the Trail Educations & Stewardship Alliance" and the Stay the Trail Educations & Stewardship Alliance mountain and trail logo are trademarks of the Stay the Trail Educations & Stewardship Alliance. These trademarks may not be used without the express written permission of the Board of Directors of the Stay the Trail Educations & Stewardship Alliance. 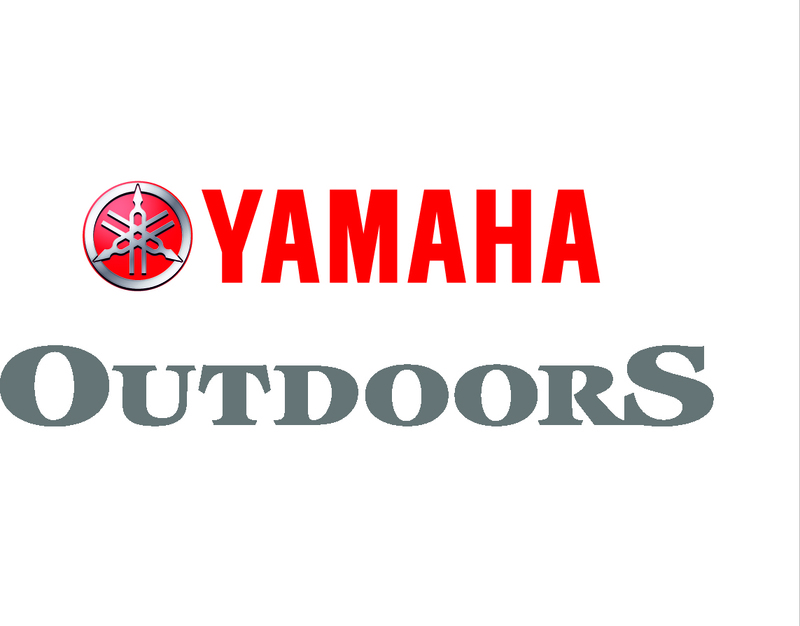 The four vehicle icons used to indicate the types of OHVs permitted on OHV trails on this website are trademarks of the Responsible Recreation Foundation. These trademarks may not be used without the express written permission of the Program Director of the Stay the Trail Educations & Stewardship Alliance Campaign. All of the Content you see on this Web site, including, for example, all of the page headers, images, illustrations, graphics, audio clips, video clips, and text, are subject to trademark, service mark, trade dress, copyright and/or other intellectual property rights or licenses held by the Stay the Trail Educations & Stewardship Alliance or by third parties who have licensed their materials to theStay the Trail Educations & Stewardship Alliance. The entire Content of the Stay the Trail Web site is copyrighted as a collective work under U.S. copyright laws, and the Stay the Trail Educations & Stewardship Alliance owns a copyright in the selection, coordination, arrangement and enhancement of the Content. The Content of the Stay the Trail Web site, and the site as a whole, are intended solely for personal, non-commercial use by the users of our site. No right, title or interest in any downloaded materials is transferred to you as a result of any such downloading. The Stay the Trail Educations & Stewardship Alliance reserves complete title and full intellectual property rights in any Content you download from this Web site. Except as noted above, you may not copy, download, reproduce, modify, publish, distribute, transmit, transfer or create derivative works from the Content without first obtaining written permission from the Program Director of the Stay the Trail Educations & Stewardship Alliance Campaign.